Hello, holiday food hangover. I did not miss you. Hello, date sweetened peach BBQ sauce. You are a lifesaver. Before I get into the recipe, I want to share some pretty personal stuff with you all because as a food blogger food can sometimes be my biggest enemy. I have to learn, just like anyone else, how to eat and cook to keep myself and my family healthy. It's pretty amazing how these small changes make a huge difference in how my mind and body function. Beginning in college, I started to be more aware of what I was eating and why. Late in high school, I was eating because I was nervous, sad, happy, frustrated, tired, awake, bored, busy...you get the idea. I had no concept of portion control and found myself nearly 30 pounds overweight for my 5 foot 3 inch frame. Something clicked during my freshmen year of college and by simply paying attention to how much I ate and exercising more regularly, I lost 20 pounds by the time I returned for my sophomore year. When Brad and I moved to Tokyo, my weight fluctuated a bit during the first year as I learned more about Japanese food (and stopped trying to find super familiar/unhealthy foods to comfort me in my fog of new-country confusion). Eventually, I settled into a healthier routine and learned a lot by simply observing how the Japanese ate. They enjoyed every morsel and, thanks to chopsticks, took smaller bites. Desserts, if there were any, were dramatically less sweet than what I was used to. Often times dessert was a few simple slices of apple or a cup of tea. Getting away from ending a meal with dessert helped me drop another 10 pounds during our time in Japan. Fast forward to my second year back in the United States post-Japan: I was becoming desensitized to sugar. By that I mean that I went from being stunned at how sweet American desserts were to not noticing the difference at all. It scared me. I started putting on more weight, feeling more emotional ups and downs, stressed and constantly exhausted. I was in the middle of all this sugar-induced junk when Jacqueline Smith approached me about taking her course, Go Sugar Free. I know. Going completely sugar free sounds terrifying for most of us. It was for me too. Would I have to give up baked goods like warm chocolate chip cookies right out of the oven? That seemed like a pretty massive sacrifice. As I learned more about GSF, I realized that Jacqueline has built a program that, instead of being all or nothing, is easily tailored to fit what you need to feel your best. During the course itself, I was about 95% sugar free. I lost 2 inches from my waist, my skin cleared up dramatically, I started sleeping more soundly and felt a more consistent amount of energy through the day (without the help of coffee). It was amazing. I still try to eat a GSF-friendly diet the majority of the time but I don't beat myself up for occasionally enjoying a sweet treat because that's what works for me. For some, saying goodbye to sugar all together is what makes them feel like the healthiest, happiest person they can be. That's the beauty. It's all up to you. Another piece of the puzzle is refined grains. They often lead to similar negative symptoms sugar is responsible for, so learning more about grain options is another huge part of the GSF course. Thanks to GSF, I have learned to think more creatively about the recipes I already use. 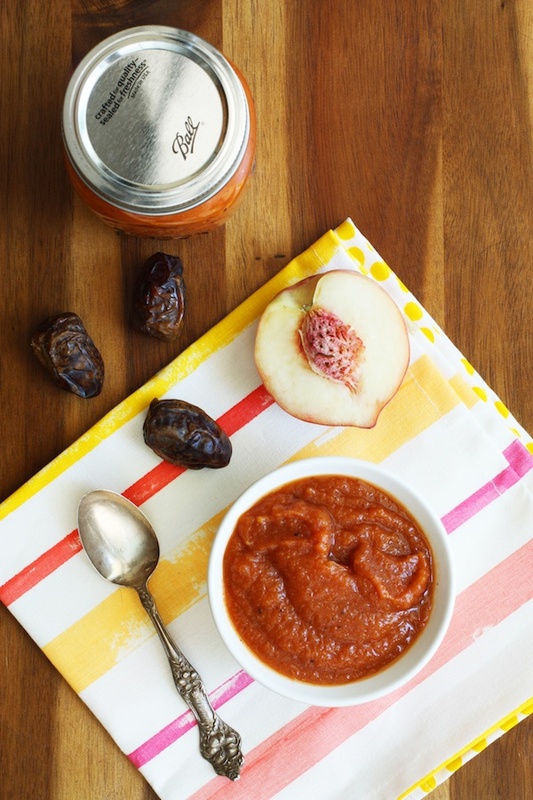 This Peach BBQ Sauce, for example, has all the important ingredients when it comes to BBQ sauce but is sweetened with dates rather than brown sugar. I've also begun using honey and maple syrup (sparingly) whenever possible. Rather than feeling tied down to a "diet", I actually feel a sense of freedom. I can enjoy the foods I love because I know more about how to make them healthy for me. Now for the big news: thanks to high demand, Jacqueline has added a Fall 2014 course (which was not on her original schedule) and registration starts TODAY. To help demonstrate how easy it is to eat GSF-friendly foods without feeling deprived, I'm going to post recipes here that are sugar and refined grain-free during the registration period! That means that if you register for the course, you'll already have a few recipes on hand to get you through. Oh, and did I mention that Jacqueline has a Recipe Library that is chock full of amazing GSF recipes and you have lifetime access after taking her course? Yes. It's as great as it sounds. If you're ready to learn more about Go Sugar Free, you can click here to read about Jacqueline, the course itself, and the positive changes you can expect to see in yourself. I strongly suggest finding a buddy to take the course with you, so if you have a friend or family member who might be interested get them to sign up as well! If you're interested in finding out more about Jacqueline's philosophy but aren't ready to commit to the GSF course, I urge you to get her eBook, 5 Easy Ways to Look Radiant Tomorrow Morning, and Don't Waste Produce (DWP) Checklist (this is a HUGE help when it comes to no-waste meal planning and encouraging the consumption of more fresh, whole foods). Combine all ingredients in a medium, heavy saucepan over medium heat. Bring to a boil then reduce to a simmer and cook, uncovered, for 30 minutes. Keep an eye on the liquid levels. It should reduce by about 1/3 but not more than that. Return to the medium heat and cover with the lid slightly ajar. Cook another 10-15 minutes. Transfer to an airtight container and use within 2 weeks. Worcestershire is one of those tricky ingredients that has a teensy amount of sugar in it but it almost a necessity when it comes to BBQ. There are recipes out there so you can make your own if you really don't want the added sugar. Also, you could use a combination of soy sauce and some of the spices typically used in Worcestershire sauce as a substitute.